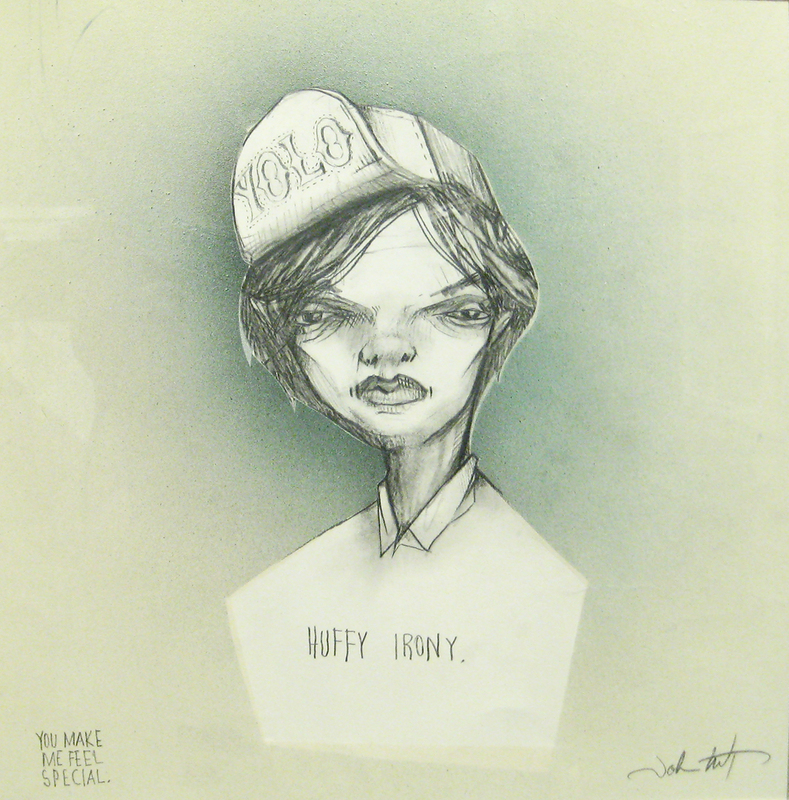 “Blame it on My A.D.D.,” John Tindel; pencil, spray paint and watercolor; 18 x 18 inches. When the danger-boy grows up he may become an artist like John Tindel, who is now showing mixed media works on paper at the Kai Lin Art gallery. The pictures have sharp edges, suggest troublesome thoughts, and interfere with productive activity. Some pieces use a form of caricature to depict young men who were probably also danger-boys, but who seem to have traded in their illegal fireworks for that adult toy called hard drugs. 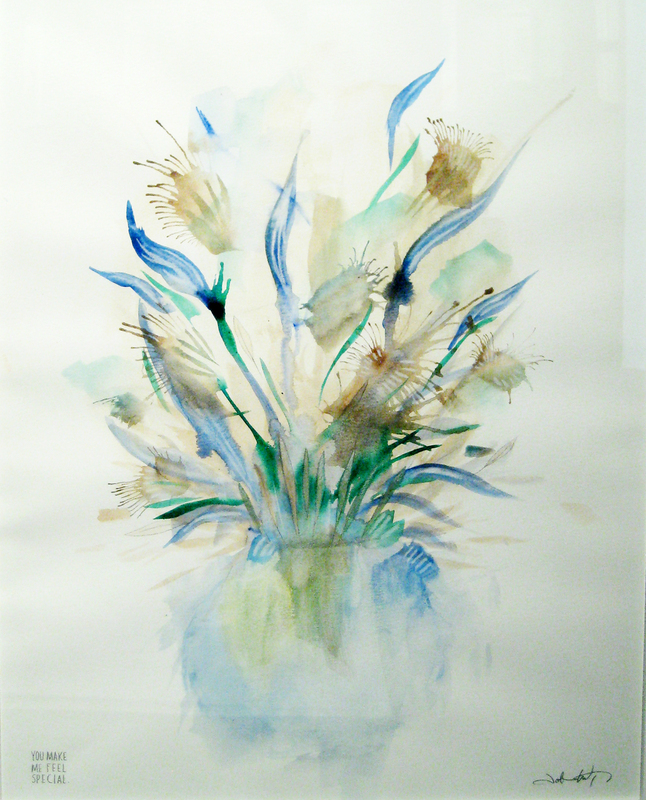 “Flower Pot Setting #2,” John Tindel; watercolor; 18 x 24 inches. The pictures don’t give the sense of glorifying drug use, or suggesting that the use of methamphetamine could inspire artistic work, spiritual revelation, or anything positive. The danger-boys, and one danger-girl (titled “She Was a Hallucination”) have wide-set, large eyes that suggest a capacity for deep thought, but are surrounded by prematurely aged and discolored skin. These are the eyes of young people exhausted by life at compulsive hyper-speed. Hope for them is in peril. One sharp edge to these pictures is that most of them carry the hand-lettered message, “You Make Me Feel Special.” The works also include some lush watercolors of floral arrangements with no references to danger-boys or crystals and clouds—these florals, too, carry the lettering, “You Make Me Feel Special.” It’s almost as if Tindel is in the middle of sketching out a line of greeting cards to be marketed to addicts and their friends and families. That market had better love irony. The pictures include visual references to African masks, Shamanic power animals, and holy men. It’s another trait of the danger-boy to mix up a bunch of flavors and see if the final product is edible. In fact, Mr. Tindel displays in these pictures how adept he is at creating unusual combinations. They may begin carelessly but they end by showing that the danger-boy is someone curious about mortality, and someone who fits in with his nervous friends and family. The John Tindel exhibit, “You Make Me Feel Special,” is on view at Kai Lin Art through September 6, 2013. This entry was posted in Art in Atlanta and tagged Addiction, Drawings, John Tindel, Kai Lin Art, Still life, Watercolor on August 22, 2013 by Bryan Alexander. Hi, thanks for inquiring. Yes, I am some kind of expert. You can follow the blog by visiting the home page, looking in the right-hand column for the “Follow” button, and following the instructions after you click on that button. Pingback: Review "You Make Me Feel Special" - TheCreativeLife.com | Tindel Co.